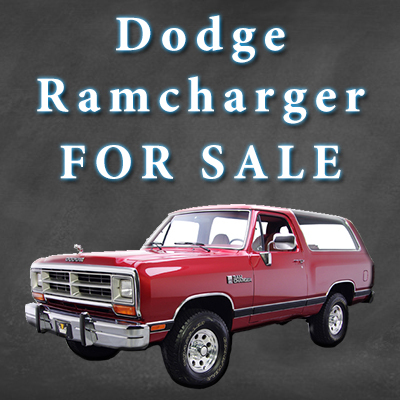 Founded in 2013, DodgeRamchargerForSale.com is an ad aggregator dedicated to displaying various Dodge Ramchargers from across North America. This includes all 1974-2001 model years in the United States, Canada and Mexico. Detailed below we talk about our site mission, process and the benefits of using our site from both the buyer and seller perspective. This also includes navigating our classifieds along with submitting an ad with us. The mission of DodgeRamchargerForSale.com is to the ultimate source of current past Dodge Ramcharger listings. We act as a liaison between buyers and sellers for current ads. We also server as an archival database for both buyers and sellers to use when researching the price of a particular model year / condition Ramcharger. We are currently the largest and oldest classifieds database online for the Dodge Ramcharger nameplate. In order to accomplish our goal we accept ads submitted directly to our site but also weekly reposts ads from Craigslist, eBay and other sources. We do this to give a complete picture of the current Ramcharger market. As listings age we make these as SOLD but leave them on our site for reference purposes. Should you find any listings we have missed during this process, please let us know on our Contact page. If you have landed on this website because you are looking to purchase a Dodge Ramcharger, there are several tools at your disposal to help you find the right vehicle. We have designed the site and setup these navigational tools to make finding the right Ramcharger easy for you. Please note when using the search box, model year or country/state functionality you will be redirected to a list view page with the most recent ads at the top. At DodgeRamchargerForSale.com we keep sold ads online so that buyers and sellers can get an idea of buying habits and selling history to assist with the process. As you are moving through the listings from top to bottom, once you have reached an ad marked as SOLD, the rest below it are likely sold as well. DodgeRamchargerForSale.com provides a completely 100% FREE resource for sellers. All that is required to do this is a simple is a simple form. Post times are between 12 and 24 hours. Listed below are a few of the benefits of listing your Ramcharger directly on this site along with other more widespread resources. If you would like to begin this process be sure to visiting our List Page for further instructions.